A crown is a laboratory-made tooth that replaces a natural tooth. It is most commonly made out of modern composite materials like porcelain or ceramic. 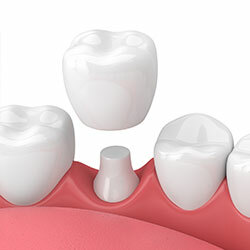 Dr. Tulipano may recommend a crown if a tooth has more than 50% decay, has been treated with a root canal, or has recurrent decay under existing restoration that is more than half of the tooth structure. The crown fully covers the portion of your tooth above the gum line, becoming your tooth's new outer surface. The process of getting a crown at our Bradenton dental office is straightforward. It begins with X-rays and a diagnosis. Then, we will take impressions and place a temporary crown. Our lab-made crowns are created right here in the USA to ensure their quality. CEREC® single-visit crowns are made in our office, eliminating the need for temporary crowns and second appointments altogether. When the crown is complete, either by a lab or with our CEREC machine, Dr. Tulipano will place it and make any necessary adjustments to achieve the perfect fit and aesthetics.